In my four decades as a skier, I’ve evolved. I used to wolf down frozen energy bars on the lifts (why would I possibly take a break to eat when there is so much skiing to do?). Now, I stop for lunch. Inside. With a desire for good food. Because here’s the truth: eating is important and food tastes so much better after a morning on the slopes. And there’s also that little truism about how food actually energizes you to ski through the afternoon. 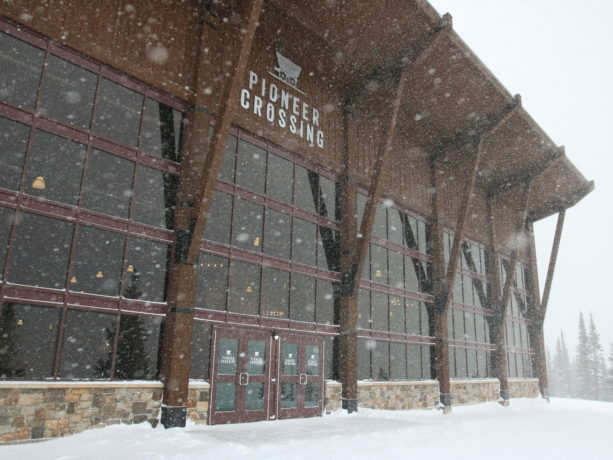 Pioneer Crossing opened in late December. 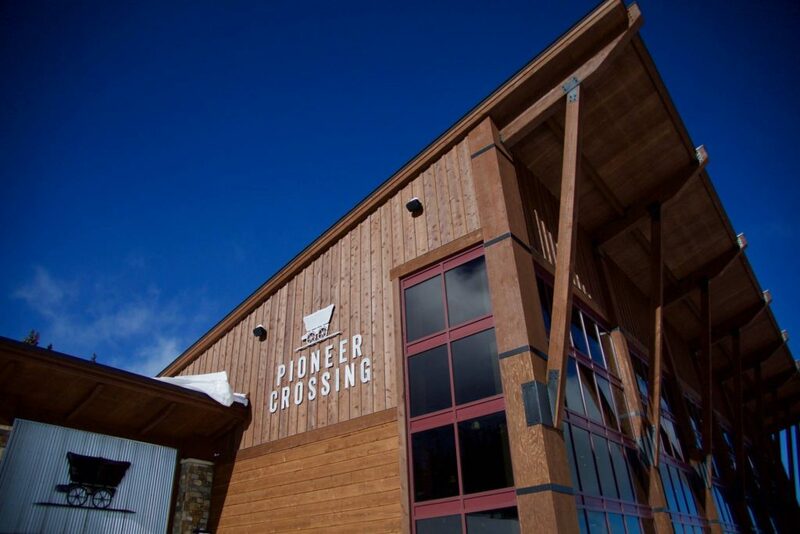 Located on Peak 7 steps away from Independence Chair, Pioneer Crossing offers elevated dining. Translation: really delicious food, unrivaled views, and cozy ambience. Come for the deliciousness, stay for the history, the views, the warmth, the camaraderie. 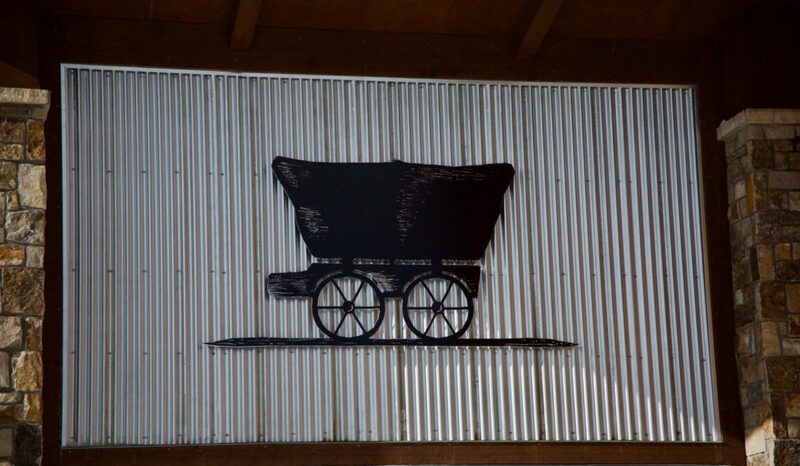 That’s why I was stoked to check out Pioneer Crossing, Breck’s newest on-mountain restaurant. Situated on Peak 7 steps from the top of Independence Chair, this contemporary, 17,500-square foot destination is decidedly not your grandfather’s chili-in-a-bread-bowl ski cafeteria. In fact, it’s more like that new hipster farm-to-table restaurant in your hometown. Sure, you might joke about how serious everyone takes their meals, but then you dine there. And with that first bite comes an epiphany. Except Pioneer Crossing is better because it’s on top of a mountain. And not just any mountain. Peak 7, with its open bowls. And then there’s neighboring Peak 6, tempting you with its glades. Add in Pioneer Crossing’s curated decoration—an homage to the region’s past housed in a state-of-the-art building—and nature’s eye candy (what can I say? I’m a sucker for views), and you get the picture. Truth be told, it’s hard to say what’s better at Pioneer Crossing: the vistas or the Colorado lamb. Sunlight floods the southeast facing floor-to-ceiling windows. And the food, with a mediterranean station, made to order salads, and a wide assortment of upscale campfire grub is fresh and flavorful. In the end, there’s no need to choose whether the views trump the meal or vice versa. Breckenridge’s newest on-mountain dining delivers on all counts—visual, gastronomical, and convenience. 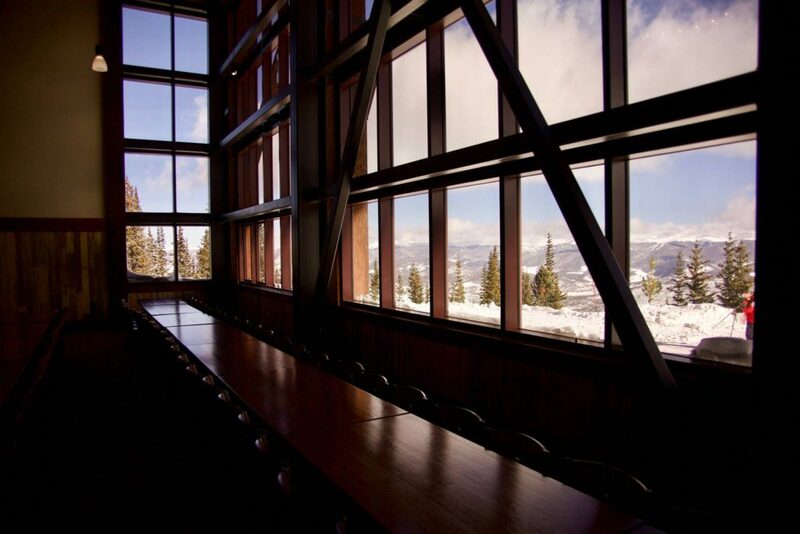 Catering to a sophisticated crowd of accomplished skiers and riders, th is is elevated dining at its best. Having such a good restaurant at the top of Peak 7 is a game changer for Breckenridge. It’s convenient and cozy (despite seating for 490 and a 50-person bar, the Broken Spoke), and it spares skiers and riders a trip to the base area for a delicious meal. It’s also welcoming. I can see this becoming a family favorite, especially once my four-year-old masters “French fries” and can use his edges on some of the surrounding blues. With the promise of whipped cream-topped hot cocoa and those “glass walls,” as my kids affectionately call expansive windows, I know my two boys will love it. And with our penchant for good food (pre-kids, my husband and I prioritized adventurous, elevated dining to the same level as skiing, which is saying something), I know I’ll be heading there a lot this winter as my family explores Breck’s peaks. Because, really, who wouldn’t opt for smoked and shaved trip tip beef sandwich or roasted wild mushroom and miso broth noodle bowl over a tooth-breaking power bar on the lift?